Today I made bread. 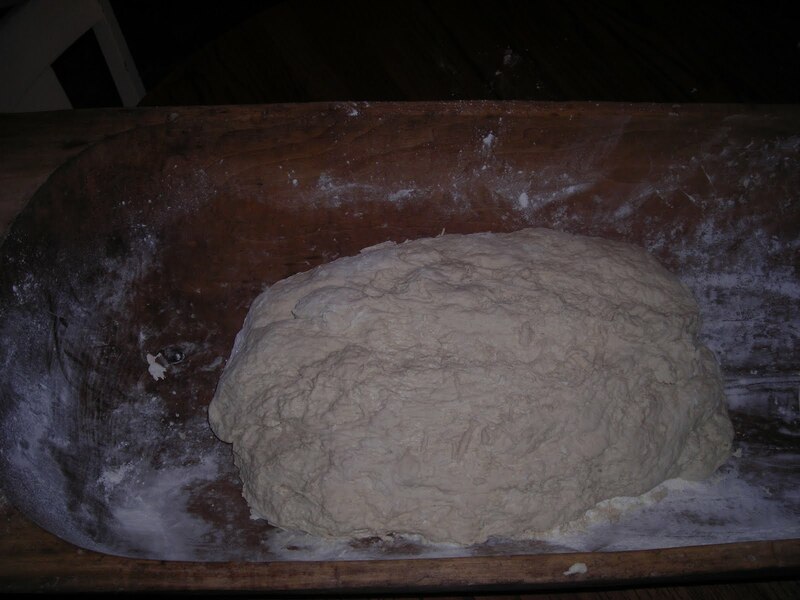 My main ambition was to give this big dough trough a spin to see what it was all about. In a previous life I had done an oral history interview with a woman who worked as a cook on a ranch in the 1950s. 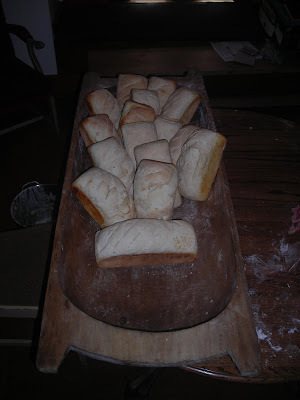 She told me about baking a dozen loaves of bread every day for the ranch hands meals. I imagine she had to have a dough trough or something like it to work up that much dough. My grandmother did it on a big board on the table. I started by multiplying my standard bread recipe which uses about eight cups of flour to make two 10-inch round loaves. I took this to the eighth power. Sixteen pounds of flour should do it. I had worked with twenty-five pounds before, but for that I had a Hobart floor mixer. I was a little worried that the round bottom on the trough would be unweildy to work with. Once it got the weight of the dough however, it settled just fine. I was also worried that it would be difficult to organize the dough in the trough. That wasn't a problem either. The volume was sized to fit the tool. Here's the dough after it came together. 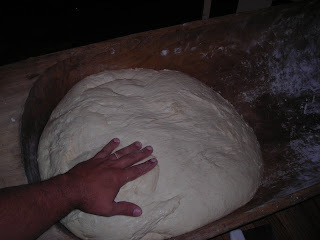 I was also worried that kneading it would be difficult in such volume. In fact it might have been easier. I didn't knead it with the usual punch and pull. Instead I streched it out into a long flat mass, and then just kept folding the ends over again. I kneaded it for about 20 minutes once it came together. 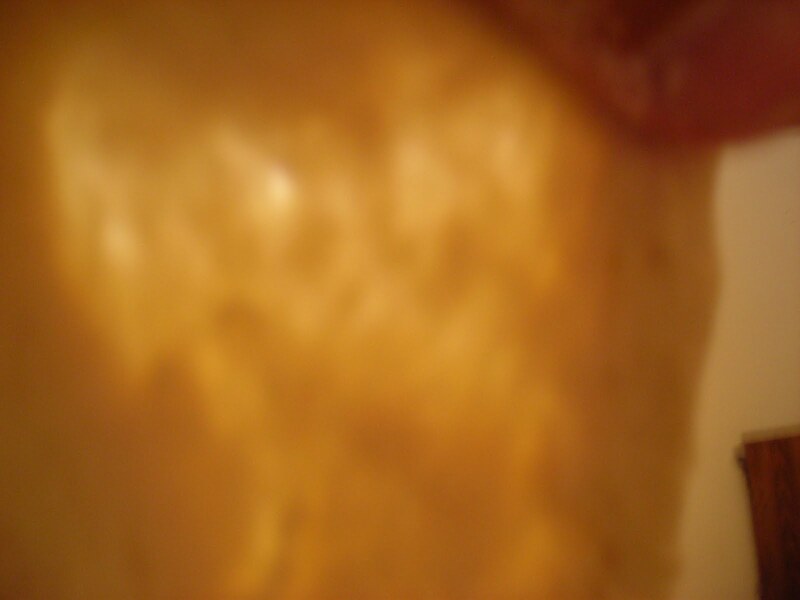 Here's the "window" test to show it well kneaded. When it is well kneaded, you can stretch a small piece of dough until it gets thin enough to be opaque, so that you can see light through it, without tearing. 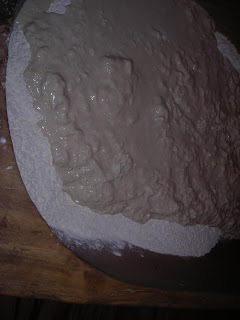 Here's the dough after rising. I can't remember if I took this before or after I punched it down. Its a lot of dough. If I had only done this much and no more, Dayenu. I really just wanted to figure out what was necessary to work with a large volume by hand. But once I had the dough, I thought I should bake it. I had to borrow bread pans from two neighbors. If I ever get to bake on a hearth in large volume, I'll have to have more brotforms for rising loaves. Making the loaves turned out to be the most tedious task. I weighed each loaf for consistency. While the loaves were rising I had a little extra dough, so I made a pepperoni pizza. So anyway, my oven holds 4 loaves at a time. I made sixteen loaves. Some turned out quite lovely, others stuck to the pan and had to be torn out. Some I'll give to neighbors, others will be made into croutons. This was a lot of bread. So based on this, I think I could do even larger volumes. It mostly depends on having enough forms for rising. A bigger oven would be helpful. And it might be nice if I had a little help. All in all, it was an interesting lesson in volumes. 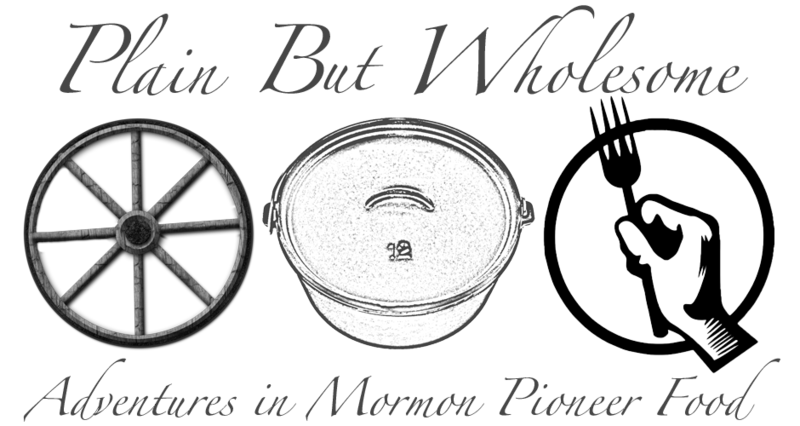 I think that for the most part, the pioneer accounts I've read talk about larger volumes than just a daily serving. This is like a foreign language to me. I kind of wish it wasn't, but not enough to start baking. One of these days, I'll have to, but until then, I'll leave it to the master chefs, like you. Quite the undertaking. Looks like your loaves turned out well, however. Congrats!